Is This The Right Time For a Big Tax Cut? The rationale behind the GOP tax plan is that the economy needs stimulus. But it's already growing and near full employment. And the plan could be undercut by the Fed as it raises interest rates. 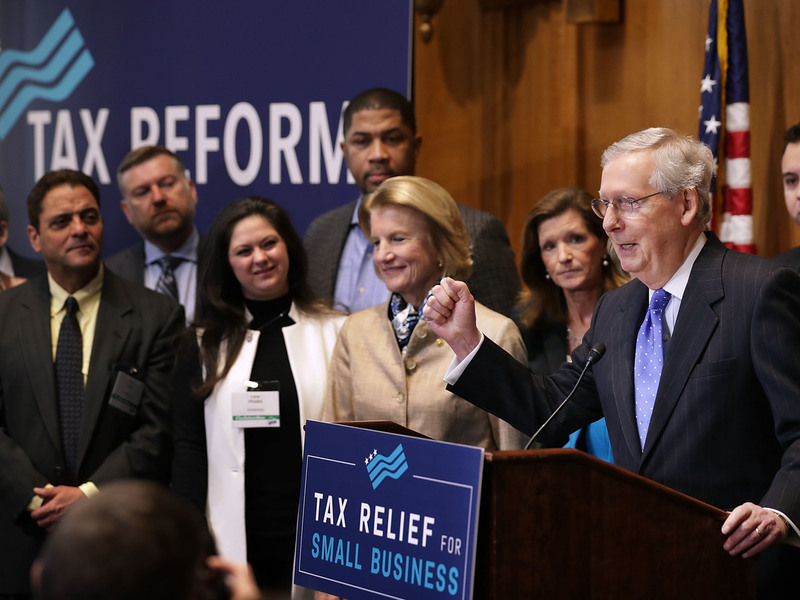 Senate Majority Leader Mitch McConnell addressed a tax reform news conference on Capitol Hill last Thursday, alongside Sen. Shelley Moore Capito of West Virginia and representatives of small-business groups. Tax cuts can be a good way to stimulate the economy when growth is slowing down, by encouraging businesses and people to keep spending when their finances are growing tighter. But the economy is in the midst of its longest postwar recovery on record, with an annual growth rate of 3.3 percent last quarter. The unemployment rate is down to 4.1 percent. Economists often argue that during periods of growth like this, governments should be paring down debt, giving them more fiscal breathing room during the next recession. "It's always valuable to keep your powder dry, if you can, so you do have fiscal space if there is a downturn," says former Fed governor Randall Kroszner, now a professor of economics at the University of Chicago Booth School of Business. But the Republican tax cuts would create more than $1 trillion in debt over the next decade, according to Congress' Joint Committee on Taxation. "I think the timing of this tax cut from the perspective of the deficit is completely upside down," says Jared Bernstein, senior fellow at the Center on Budget and Policy Priorities. He adds, "When you get to this stage of recovery and you're closing in on full employment, you absolutely want your deficit and debt to be coming down." There's an even bigger, macroeconomic problem with pushing through tax cuts right now. If tax cuts are done right, they can increase incentives for investment and lead to productivity growth, Kroszner says. But they can also lead to higher inflation, which can spur the Fed to raise interest rates. "If it's seen as something that's just short term, the Fed is likely to offset that by making sure the economy doesn't overheat and inflation doesn't get too high," Kroszner says. That's a real concern right now. To Fed policymakers, the economy is already at or near full employment. They've already raised rates twice this year and are widely expected to do so again this month. While supporters say that tax cuts would boost growth, Fed officials may decide they amount to more stimulus than the economy needs. "I think they would say we already have pretty much a fully employed economy. A boost to aggregate demand is not exactly what the doctor ordered at this point. So maybe we should offset some of it by raising interest rates faster," says former Fed Vice Chairman Alan Blinder, a professor of economics and public affairs at Princeton University. In an interview with The Wall Street Journal last week, New York Fed President William Dudley said he supported efforts to make the tax code simpler, but he appeared to question the need for a tax cut. "It would be a reasonable question to ask, is this the best time to apply fiscal stimulus, when the economy's already close to full employment?" Dudley said. "It's probably not the best time."